Every development client tells me the same thing: When it comes to donor-centered fundraising, you must thank your donors. And thank them again. A number of years ago we started a Past Presidents Circle. With a history of 108 years, there were a number of women still involved in the community and the YWCA. The Circle meets annually, inducting in the newest past president. This year I wanted to present them with something special, a keepsake they would treasure, just as we have treasured them. That is when I sat down with Sandy. I looked at how she has worked with other groups to create a special talisman and I knew I had found the right person to help carry out my vision. Sandy listens and asks questions until she knows exactly what your goal is. She has perfect crafts(wo)manship. The result is a beautiful pendant. I cannot wait to give it to my past presidents! When I first met with Sandra Lewis, my intention was to create a personalized gift for my financial planning clients that would help differentiate me from my competition. I certainly got a lot more than that!! Sandra not only designed an extraordinary work of art that was within my budget, but she developed a compelling story and message around the bracelet. My clients not only wear the iconic compass (which is gender neutral), but actively use it to remind them of their own financial goals and journey. I still get a thrill when a client tells me she looked at her bracelet for financial guidance. My clients literally carry me, and my message wherever they go! My clients feel honored to be awarded a Creative Genius You talisman. We’ve given these beautiful reminders on red leather to each of our CreativeGeniusPortland series participants. The rest of the world is enjoying purchasing this product through our online stores. Working with Sandra Lewis was a dream. She adjusted the design and delivery to meet our needs and was gracious. We couldn’t be more thrilled with the finished product! Cordy Galligan, Director of Marketing and Business Development. Sandra Lewis’s work is sublime. 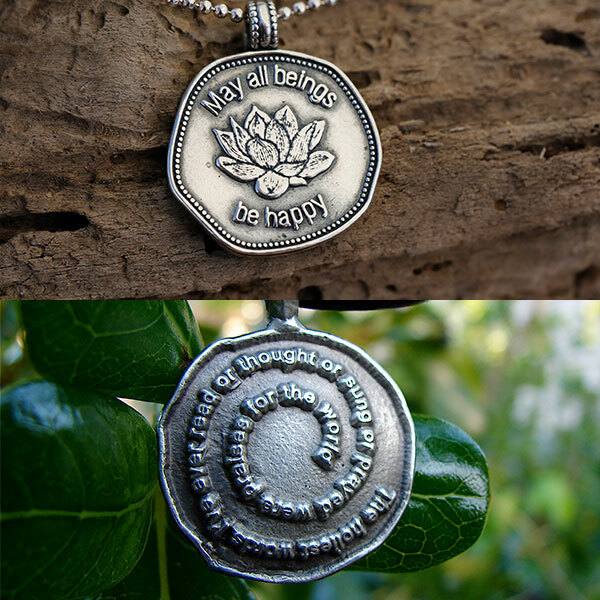 The Praises for the World and Lotus medallions are a beautiful way to carry forth the message in the music. I meet people all over the world who are wearing them! What a joy!